The exact date the first settlers went to the Valley of Florissant is unknown, but it is one of the oldest settlements in the state of Missouri. Some historians believe it was settled about the same time as St. Louis. The first civil government was formed in 1786. Spanish archives in Havana reveal there were 40 people and seven plantations in Florissant at the time of the 1787 census. The village, called “Fleurissant,” or “Blooming” in English, by its French settlers and “St. Ferdinand” by its Spanish rulers, was a typical French village with its commons and common fields. Originally a separate town, and now an inner suburb of St. Louis, the community was centered on (and frequently called after) the parish of St. Ferdinand. As late as 1889, the town was predominantly French-speaking (while the southern portion of the metropolis was populated by German-speakers). The first train line to the area was constructed in 1878 – an extension of the line which went from St. Louis City to Normandy. The last train to Florissant ran on November 14, 1931. Following World War II, Florissant went from a small village community to a large suburban center, as developers such as Alfred H. Mayer Co. and others began building subdivisions on what was formerly farmland and empty acreage. Approximately 18,000 houses were built between 1947 and 1980, and the population swelled to its peak of about 76,000 in the mid-1970s, making it the largest city in St. Louis County. James J. Eagan was mayor of Florissant for 37 years from 1963 until his death on November 2, 2000. He was re-elected to the office 9 times and became one of the longest serving Mayors of any city in the United States. In his final year, he was awarded the title of Best Politician in St. Louis by the Riverfront Times. The civic center off Parker Road is named the James J. Eagan Community Center in his memory. 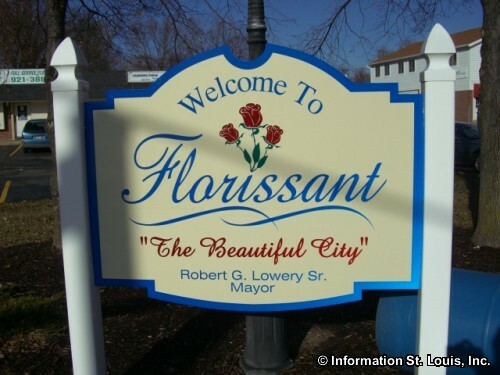 In 2012, Florissant was ranked 76 in the top 100 list of Money Magazine’s Best Places to Live – America’s Best Small Cities. Other recent reports have Florissant ranked as the #1 Best Small City to Retire To in America and the 2nd Safest City in Missouri. According to the United States Census Bureau, the city has a total area of 12.87 square miles (33.33 km2), of which, 12.56 square miles (32.53 km2) is land and 0.31 square miles (0.80 km2) is water.